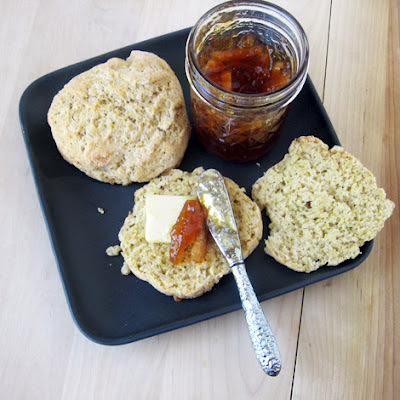 Is there anything more delicious than a homemade biscuit? Not according to Paul, whose eyes glaze over whenever I announce that we’ll be having a weekend breakfast of biscuits and gravy. And who blames him? After all, biscuits have been a staple at the family table for centuries – and for very good reason. Been working on a lot of biscuits in the kitchen lately to develop the perfect recipe for the Go Bold With Butter blog we've been writing for. 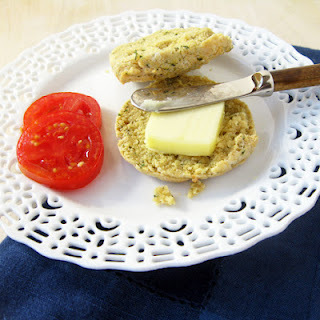 In the process, we developed a simple, modified technique that won’t require you to roll out the dough or haul out your biscuit cutters. They’re chock-full of flavor, thanks to the addition of lemon zest and a bit of fresh thyme. And they’re just about foolproof -- buttermilk, along with real butter, in the dough creates a tender flaky biscuit that won’t disappoint. 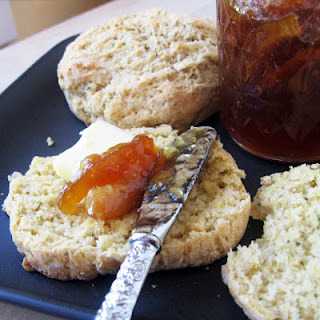 These lemon and thyme-infused treats are delicious with a bit of lemon marmalade, as shown int he picture. But, they also make a great dinner biscuit... I'm envisioning these being perfect next to a delicious slice of roasted chicken with garlicky green beans on the side. Plus, they freeze well, so don’t be afraid to make the entire batch even if you can’t eat them all in one sitting! Just writing about these makes me wish it was the weekend again... such a great breakfast. If you thing these look good, check out the Buttery Basil Biscuits we developed for the Butter Blog using yogurt instead of buttermilk! I understand. I love biscuits too! I should definitely try a bit of thyme and lemon in my recipe the next time I serve them.